The newly constructed Tribal Cultural Centre at Ooty, a parting gift of the late, lamented Chief Minister of Tamil Nadu, is likely to be opened for public any time now. Sir, it is learnt that the Badaga Culture may not find a place in the Centre. If it is true, it will mean a grave injustice to the Badaga community and to the Nilgiris. In recent years there have been a misleading supposition that the Badagas do not belong to the original tribal communities of Nilgiris and that they were migrants from somewhere in Mysore. Nothing can be more preposterous and mindless than such claims or views. This needless controversy has surfaced in the past few decades following some publications by foreign anthropologists. According to them Badagas might have migrated from Mysore as they believe the word ‘Badaga’ denotes ‘Northeners’. The assumption itself is highly questionable and without foundation. Even assuming the correctness of such claims, according to such anthropologists the migration took place sometime in 1550s. That is, some 500 years ago when the world, as we know now, had hardly been formed. There was no United States or Britain or Europe; nor India or Madras or Tamil Nadu!! The people of the whole world was migrating and yet to settle down. Is not five centuries enough to accept the Badaga claim as a native tribe of Nilgiris? Besides, there is absolutely no evidence as to who came first and who came later among the Todas, Badagas, Kotas, Irulas and Kurumbas, the main tribes of Nilgiri uplands. The very question of Badagas or any other tribes of Nilgiris having come from somewhere is meaningless and needless. How many communities or castes in Tamil Nadu can trace their origin or where they originated? Unlike most other communities and castes of Tamil Nadu, the antiquity and social and cultural uniqueness of the Badagas have been well researched and documented by Indian and foreign scholars. The Badagas claim for inclusion in the list of Scheduled Tribes may not have been accepted. But none can deny their status as a Nilgiri Tribe. Just as Tamilians include various tribes, castes and communities the Badagas too include several groups of people. A small group of Badagas even today marry from Mysore. One group of Badagas has obtained the Most Backward Class status from the state government while the rest are classified as Backward Class. The needless controversy over Badaga history has already led to serious social, cultural, economic and administrative consequences in the Nilgiris. The discontinuation of enumeration of Badaga as a separate language in the last two census has led to a peculiar problem of not knowing how many Badagas, the largest social group, are there in the Nilgiris. a) Provide due space and content for Badaga Culture in the Tribal Cultural Centre before its inauguration. b) Institute an enquiry as to why Badaga language, unlike in the previous census, had not been enumerated as a separate language in the last two census and restore its separate enumeration from the 2021 census onwards. c) Constitute a high-level committee to confer a suitable categorization to the Badaga community, such as Mountain/Hill Tribe or Indigenous People, pending their representation for the status of a Scheduled Tribe. Sir, your kind attention and intervention will certainly gratify the departed Chief Minister’s noble soul; for, the Badaga community was always very close to her heart. I applaud your appeal for the inclusion of Badaga culture in the cultural centre display, but you weaken your case somewhat in the early part of your letter by some very obvious errors. These suggest the writer doesn’t know what he is talking about. First of all, and of least significance here, Britain and Madras were indeed well-established entities five hundred years ago. As for the word “Badaga”, all linguists agree that it means “northerner”, without any doubt. Badagas told Fenicio in 1603 that they were northerners. Since that date, it is not “foreign anthropologists” who have “claimed” this, but rather the many dozens of Badaga elders who have told them this, and ever since 1832: the literature makes this very clear, and Breeks in particular made it very clear in 1873. So calling this a “misleading supposition” is casting doubt without any supporting evidence to the contrary. Future generations of Badagas don’t deserve to be bamboozled about their own history! Some elders have in fact told me not just that their ancestors came from Mysore, but from precisely which villages they came. The Todas have also told us that the Kotas too, a Scheduled Tribe, came from the plains, yet you make no mention of this interesting fact. A lot more could be said about this, but it is already in my books or in a 2016 volume on Indigeneity. This said, the three points you make at the end of your request to the Chief Minister are altogether valid requests, indeed are the least that we should expect of him. The arbitrary decision to “hide” the number of Badaga speakers among Kannada speakers in recent censuses has been especially egregious, in view of the publications of grammars and dictionaries of the Badaga language by R. Balakrishnan, C. Pilot-Raichoor and myself that make the independent status of the language crystal-clear. Let us hope that the state government takes some constructive action on this long-fesstering issue, and Badaga culture gains true recognition for its role in creating the modern Nilgiris! I know you will take offence but the stakes are getting higher and Badagas themselves seem so ignorant of what is going on. I mentioned 'misleading suppositions' to mean vague assumptions and not incorrect assumptions. For academicians Badaga origin may continue to be a matter for investigation but it has caused a lot of confusion to the present outsiders and Badagas. No one really bothers to read your's or other's book. It is just word of mouth or some silly newspaper article. That is the reason why I have to do what I am doing now. Of course, my history is poor but surely the world of today is vastly different from the world of 1800 or 1550s. Why dig up the roots of just one small community? Does it serve any purpose? On the contrary it can and has already caused a lot of trouble. If I were a migrant from the hot plains of Mysore I would rather settle in the warm lower slopes of Gudalur than claim up all the way, risking wildlife and other unknown dangers, to settle in some remote and cold heights. Badaga no doubt means Northener. 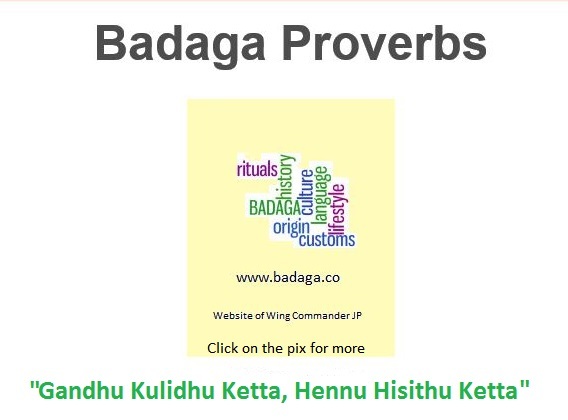 And Badagas evidently had a great sense of geography, astronomy etc but was the name given by outsiders or Badagas themselves to outsiders coming to the hills. It is quite possibly a term to denote those like the lingayats who came to the hills in different periods. If there had been a original and mass migration it would have found a place in our proverbs, sayings and omens etc. When Counsel of the Ancients laid down over thousand do's and don'ts for the Badagas,why were they silent on the origin. Obviously it was too old for them too !!! I hope you understand the prevailing circumstances which make it imperative for me to bring out these issues. Of course, it is a thankless task. I appreciate your well-reasoned letter. My books are directed at the educated public, which is including more and more Badagas. I don’t expect a casual reader in Coonoor to know what is meant by ‘uxorilocal residence’ etc., But people who are serious about this will look it up or know already. The audience I am addressing is not just people in the Nilgiris, either, but the increasingly large diaspora and especially their children who have hardly set foot in a Badaga village. These are the people who later in the century will be wondering about where their fathers and mothers came from. And this is not an idle thought on my part. Anthropology may not be very popular in India — and one can make a strong point that the studies have been done by ‘foreign anthropologists’ for the simple reason that Badagas are not interested or trained in this. (I know about Verghese, but he studied Kotas, and moreover has been dead for many years.) It is very normal for students of Indian origin going to universities in the West, as thousands do, take some anthropology courses because they are required to take a certain number of social science courses. This often can lead to term papers or theses on Nilgiri topics. But when they come to look into the available library resources, nearly everything is by me! And if their interest is ‘the origin of….’ they find such nonsense floating around in the heads of their friends and relatives as the idea that the Todas came from Greece (else why would Prince Peter of Greece, a good anthropologist, be interested in them? 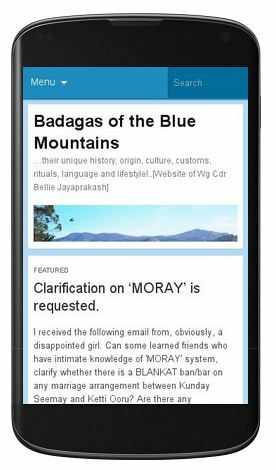 ); or a recent claim on a website that “the Badagas have been on the Nilgiris for 8000 years”; or an idea that Ari Gowder shared with me that the Badagas must have come from Bengal because he saw similarities between the gudikat and decorations at Buddhist funerals in Bengal….. These baseless ideas will be useless to future generations, especially those who, we may assume, will be interested in studying the Badagas seriously. So I am doing the best I can to present all the relevant evidence for my conclusions — which can always be modified by new evidence.